The grandson of the late Kim Jong-il and nephew of North Korea leader Kim Jong-un has given a rare TV interview from Bosnia, where he is studying. Kim Han-sol, 17, said that he wished to ''make things better'' for the people in his country. He was speaking to former UN Under-Secretary General Elisabeth Rehn in an interview for Finnish television. He is the son of Kim Jong-nam, eldest brother of Kim Jong-un, who has been living in Macau and China. "I've always dreamed that one day I would go back and make things better and make it easier for the people there," said Kim Han-sol, in fluent English. 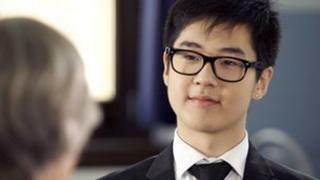 Sporting ear-studs, styled hair and a black suit, the teenager spoke of his dreams of reunification of the two Koreas in the televised interview. He had South Korean friends, he said, and while it was awkward when he first met them, ''little by little'' they started to understand each other. ''Through meeting people, I've concluded that I will just take opinions from both sides, see what's good and what's bad, and make my own decisions,'' he said. It is not clear why Kim Han-sol agreed to the interview. He first drew international attention in October 2011, when pictures and comments on his Facebook page were reported by South Korean media. His account was quickly blocked and it was reported that he would be studying at the United World College (UWC) in Mostar. Ms Rehn is the patron of the UWC initiative in Bosnia. She is also formerly Finland's Minister of Defence and a UN special rapporteur for Human Rights in Bosnia-Hercegovina. Kim Han-sol said he had never met his grandfather or uncle. He described an isolated childhood spent mostly in Macau and China, after his birth in Pyongyang in 1995. He only realised who his grandfather was after putting ''pieces of the puzzle'' together as he grew up. ''I was actually waiting for him... till before he passed away, hoping he would come find me, because I really didn't know if he knew that I existed," he said. On the succession, he added that he did not know how his uncle, Kim Jong-un ''became a dictator". "It was between him and my grandfather," he said. His father, Kim Jong-nam, 39, was thought to have fallen out of favour in 2001 after he was caught trying to sneak into Japan using a false passport. He told officials that he was planning to visit Tokyo Disneyland. He has maintained a low profile overseas but he was quoted by Japanese TV station Asahi in October 2011 as saying he was opposed to ''dynastic succession''. "My dad was definitely not really interested in politics," Kim Han-sol said, when asked why his father was passed over for succession. As for his own future, he said he pictured himself going to university and then ''volunteering somewhere''. ''I would like to engage in more humanitarian projects, work to contribute to building world peace, especially back home because that is a really important part of me,'' he said.